The Douglas DC-3, an airliner which carried 21 passengers, was first flown in 1935. It was designed and patented by chief engineer James H. (Dutch) Kindelberger and designer Arthur E. Raymond (1900-1999) to compete with the Boeing B-247. The B-247, which made its first flight in 1933, was the first all-metal monoplane transport, based on an earlier B-9 bomber designed by Claire Egtvedt. It had been ordered by United Air Lines, had twin engines and a retractable landing gear, carried 10 passengers in a heated, sound-proof cabin, and was able to cross the country in 20 hours, cruising at 155 mph. Later versions of this design evolved into the B-17 Flying Fortress of World War II fame. A single prototype of the competing twin- engine Douglas 12-seat DC-1, flew in 1933, and the first production version, the DC-2, began scheduled service for Transcontinental & Western Air (later TWA) on the Newark-Chicago run in 1934, carrying 14 passengers. Commercial success of the DC-2 initiated the 1934 development of the DC-3 which went into service for American Airlines in 1936 and which became the first to make commercial air travel profitable and realistic. By 1942, 90% of airliners in use were DC-3s. 11,000 were eventually produced. During WW II, the DC-3 was called the Dakota by the British, the C-47 Skytrains by the Air Transport Command, R-4Ds by the Navy, and the Gooney Bird by most troops. Though production ceased in 1946, two thousand DC-3s were still in service in the late 1980s. Donald W. Douglas, an aircraft designer, founded the company in 1920, with most of its work for the US Army Air Corps. In 1924, a Douglas US Army plane, the Chicago, piloted by Lt. L.H. Smith, completed the first flight around the world in 351 hours flying time. Commercial transatlantic flights did not begin until 1939, when the flight took 26.5 hours. 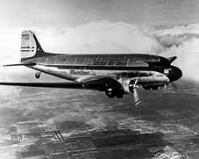 Following the success of the DC-3, Douglas produced a bigger 4-engine transport for the Army, the C-54, which, after the war, became a civilian transport, the DC-4. It was used extensively for transatlantic flights from 1946 onward. Improvements continued with the 4-engine DC-6 (1948) and DC-7 (1953). Later jet versions were the DC-8 (1958), the DC-9 (1965), and the 3-engine DC-10. The Douglas company later became part of the McDonnell Douglas Corporation.